Despite being referred to as the most important meal of the day, many breakfast favorites have dubious nutritional value. Pancakes, French toast and half the cereal aisle fall into this category. Few, however, seem as relentlessly unhealthy as the doughnut—typically a total sugar bomb. And then, of course, there’s that old American staple: the Pop-Tart, which has about a penny’s worth of nutritional value. That’s not a metaphor; I’m pretty sure Pop-Tarts have the same nutritional value as a minted piece of copper. 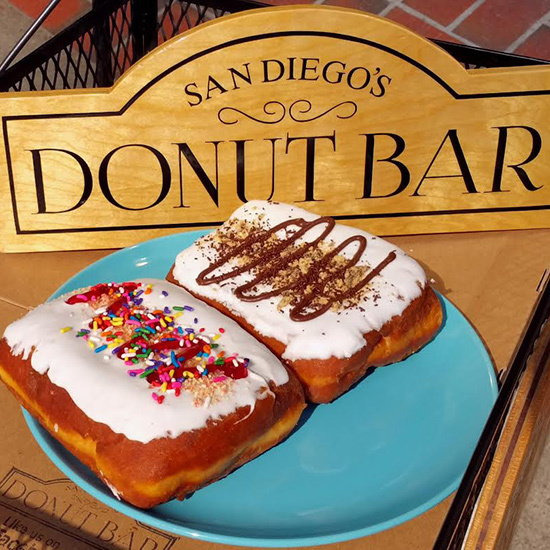 The Donut Bar, however, finds both doughnuts and Pop-Tarts perfectly acceptable. So much so, in fact, that they’ve combined the two in a Pop-Tart-stuffed donut known as the Big Poppa Tart. Now, if you are an experienced Pop-Tart eater, you might find yourself wondering: How do you fit an entire Pop-Tart inside a donut? Well, apparently, you just make a really big doughnut. These giant rectangle pastries look kind of like what you might imagine a Pop-Tart would look like after it ate nothing but doughnuts for a year. They weigh in at a solid pound. Not that a Big Poppa Tart doesn’t sound delicious. You may just want to bring a group of friends to eat it with.